The promise of a high-speed data connection into people’s homes has been around longer than the Worldwide Web. Digital technologies developed in the 1980s, which made possible the transmission of voice, video, and text over the same wire, upped the ante in the information revolution. Mass media would no longer mean the transmission of identical messages to millions of people, but rather the transmission of messages and images from multiple sources, tailored to specific needs, to millions of people in their home. Lots of things were never to be the same according to prognosticators of the 1980s. High-speed links to the home would revolutionize democratic participation, entertainment, health care delivery, education, commerce, and more. Integrated Services Digital Network (ISDN), developed in the 1980s at Bell labs, was the earliest hope for making digital dreams a reality in the home. ISDN allowed voice, video, and data to be transmitted at, for those days, a very fast rate of 64 kilobits per second (Kps). As that technology improved throughout the 1980s, it was thought that most homes would one day be equipped with ISDN. However, the promise was never realized. In 1990, one telephone company, GTE, had begun a trial in Cerritos, California, where consumers were equipped with high-speed fiber optic connections to the home. It, too, did not thrive. Cable companies also entered the act around the turn of the decade by touting interactive TV as a way to bring high-speed connections into people’s home that would offer not just video-on-demand, but health care, games, and other information services. In 1994, Time Warner Cable launched a trial in Orlando, Florida, called the Full Service Network as a test bed for high-speed interactive services. Neither this nor other trials met much success, and the Full Service Network was quietly mothballed after a short time. The invention of the Worldwide Web in 1991 and the subsequent widespread adoption of the Internet renewed the hopes for broadband to the home. With the Web making the Internet easily navigable and with home computer purchases on the rise, technology backers hoped that the expanding ranks of technophiles would demand high-speed, or broadband, connections at home. Alas, even in the era of the Web, some firms that hoped to capitalize on broadband to the home have foundered. Perhaps the most trenchant example of this is the failure of Excite@Home. The ambitious attempt to marry a content company, Excite, with the broadband provider @Home, failed as its business model proved unsustainable and as subscriber growth fell short of expectations. Declining dot-com share prices also proved punishing to the company. Once valued at $6.7 billion, the company filed for bankruptcy at the end of 2001 and shut its doors in February 2002. Cities and towns have also tried to enter the broadband fray. Many places have considered or built citywide high-speed networks to improve government service delivery and promote economic development. Some sizable cities in the mid- to late 1990s, such as Chicago, Seattle, Palo Alto, and Austin, Texas, contemplated building city-supported broadband networks. One that came to fruition, in Palo Alto, met tepid customer response. Others, such as Austin’s, stalled due to controversy over whether municipal government should be offering services that compete with private sector in broadband development. Because of debate over government’s role in such networks, eleven states prohibit cities from building broadband networks to serve retail markets. More recently, rural communities, worried that the private sector may not extend broadband networks to their areas in a timely fashion, have undertaken broadband initiatives, often using city-owned electric utilities as the vehicles for network development. Among the examples of smaller communities that have developed broadband are LaGrange, Georgia and Glasgow, Kentucky. By some estimates, some three-dozen small municipalities offer broadband service to residents and businesses. All hope broadband will spur economic growth in their communities, although customer enthusiasm has not always been as high as envisioned. A problem facing providers of high-speed home connections—public or private, before the Web or after its development—is the “chicken and egg” dilemma with respect to consumer demand. Companies or towns considering the sizable investment in high-speed infrastructure for homes have reason to pause, since it is hard to predict how many consumers would want such connections and what information services they would demand once they had them. Consumers, for their part, might be willing to pay for innovative online services, such as video-on-demand, online shopping, or home health care. But potential providers of such expensive online content do not want to incur the cost of creating those applications without assurance that the high-speed networks are built out and ready to serve customers. The multiplicity of broadband trials and pervasive uncertainty about consumer demand point to a key question: What do Internet users with broadband connections in the home do online? This report sheds light on the answer to that question. We conducted a callback survey in February 2002 of 507 Internet users who had told us in past surveys that they have home broadband connections—either cable modems or digital subscriber line (DSL) service. 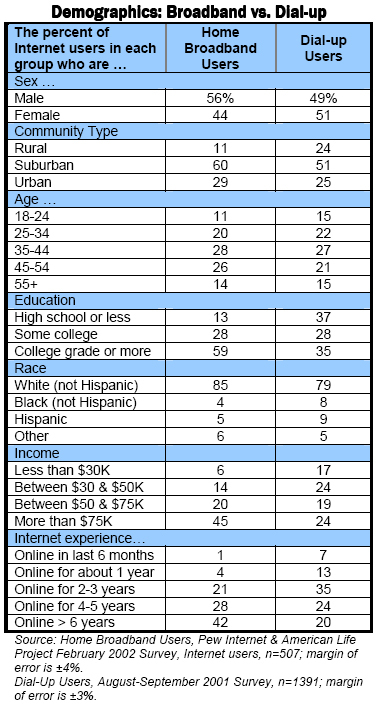 The callback survey examined what broadband users do online, what additional things they do online because of the high-speed connection, and how it has affected their lives and jobs. In addition to the survey, this report uses information gathered by broadband users who responded to questions posed on the Pew Internet Project’s Web site that asked them to describe their experience with their home broadband connection and how it has changed their lives. Even with uncertainty in the marketplace, penetration of broadband Internet access has been steadily rising. 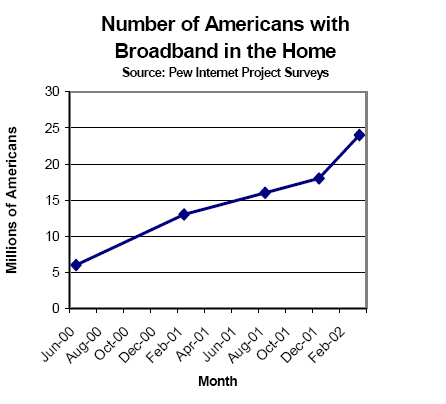 When the Pew Internet and American Life Project in June 2000 first asked Internet users about the type of home connection they had, 6% of Internet users had a high-speed connection at home. That is 3% of all Americans, or approximately 6 million people. By February 2001, penetration had risen to 13% of all Internet users. By the end of 2001, 16% of Internet users reported being broadband users. Our latest survey shows that broadband penetration has increased four-fold in about two years. In May 2002, 21% of all Internet users in America have broadband in the home; that is 24 million, or 12%, of all American adults. In our February 2002 callback survey of broadband users, 27% of them said they subscribed to DSL, 71% used cable modems, and 2% used satellite or fixed wireless technologies. The advent of broadband in the home transforms the Internet from a “sometimes” tool for finding information and communicating with others to a pervasive information appliance that exponentially expands people’s ability to create, download, and access information in cyberspace. The always-on character of home high-speed connections turns people into very different kinds of Internet users. All Internet users—either dial-up or broadband—greatly value the possibility they can use their connections to participate in many-to-many communications. For dial-up users, this manifests itself in extensive emailing with family and friends and active participation on the listservs and chat rooms of online communities. Broadband users do these things and more. They also become information producers and downloaders in ways that differ fundamentally from their dial-up counterparts. 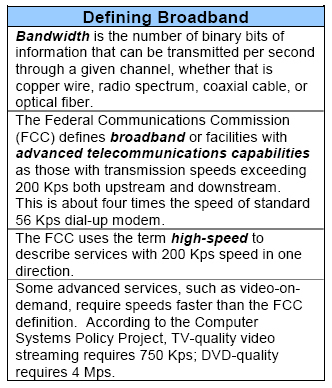 Some of these differences have to do with the traits of broadband users. They are generally the Internet’s early adopters who have taken their online experience to the next level. 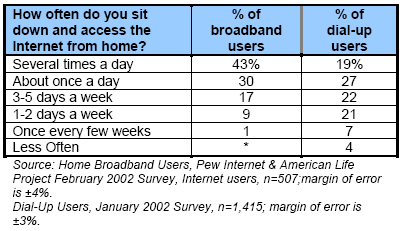 As the table at the left shows, nearly half (42%) of broadband users have been online since 1996 or before, while only one in five (20%) dial-up users have that much online experience. Typical of early Internet adopters, broadband users are wealthier, better educated, and more likely to be men than dial-up users. And the broadband crowd is more suburban and urban than the dial-up population. The dial-up group is proportionally more rural. Some of this difference is probably due to availability; the Federal Communications Commission reports that 97% of the country’s most densely populated zip codes contain broadband subscribers, while just 49% of the least populated zip codes do. Despite concern, particularly in technology and industry circles, that broadband deployment is occurring too slowly, our data suggest that broadband’s roll out is unfolding much like other technologies. High-speed Internet has taken four years to reach the critical mass of 10% adoption, according to the FCC. It took four years for the personal computer to attain 10% adoption, 4 and one-half years for the CD player, and 8 years for cell phones. The table here summarizes adoption rates for several consumer technologies. Comparable data are difficult to come by for the Internet, since it was “invented” in 1969. By 1996, however, roughly five years after the Web came online, about 19% of U.S. households had Internet access, according to the U.S. Department of Commerce. Why do broadband users obtain high-speed connections? Half cite the simple desire to have faster Web access, perhaps because it is clear to them that speedier access to information and the convenience of Internet communication is its own virtue. Others cite a variety of reasons for upgrading their connection, including their desire to perform job-related tasks at home, their ability to download files in less time, their interest in online multi-media offerings, their desire to have an always-on connection, and their interest in freeing up a phone line for telephone calls. Many broadband users (81%) have become accustomed to high-bandwidth connections at work, with fully 43% of all broadband users saying that the fast connection at work influenced their decision to upgrade the home connection. With one-third of broadband users being occasional telecommuters, it is no wonder they value the fast connection. The most obvious way that broadband changes users’ Internet habits is the frequency with which they go online from home. On a typical day, almost three in five (58%) Internet dial-up users log on to check email or browse the Web; 71% of the most experienced dial-up users (those online for 6 years or more) log on on a typical day. For broadband users, 82% are doing something online on a typical day. Fully 86% of broadband users who have been online for more than 6 years are online on a typical day. The increased frequency with which broadband users do something online is also associated with a steep increase in frequency with which they do different Internet activities. In our survey, we ask users what they did yesterday online, which yields a portrait of what the broadband population as a whole does online during a typical day. We also ask people if they have ever done a particular activity online. The analysis in this section, and most of this report, focuses on a typical day’s worth of Internet activities for the broadband user population compared with dial-up user population. An appendix to the report compares the share of broadband users who have ever done an activity online with the averages for all Internet users. Pick any Internet activity and a broadband user is more likely to do it on a given day than a dial-up user – usually it is the case that the broadband user is much more likely to be doing the activity. For dial-up users, the act of getting information, such as news, product, or job research dominates their daily surfing habits. The same kinds of information-seeking activities play prominent roles in broadband users daily Internet habits. However, the extra bandwidth encourages more of them to download files, produce information for the Web, and complete online transactions. The differences between dial-up and broadband users are striking when it comes to producing information and sharing files. A broadband connection increases the likelihood that a high-speed user will download files or music, create content, or share files online three to five times, compared with dial-up users. Broadband users are similarly much more likely than dial-up users to conduct transactions online. This probably reflects the higher incomes of broadband users. The fast upload and downloading speeds and the always-on connection of broadband also expand greatly the scope of a typical day’s worth of activities for broadband users. On average, a broadband user does about 7 different things online during a typical day of Internet activity, whether that means paying a bill or finding health care information online. By contrast, a dial-up user in August 2001 was likely to engage in only 3 different activities online on any given day. Broadband users also spend more time online on a typical day than dial up users; broadband users spend about 95 minutes online during that average day compared with 83 minutes for dial-up Internet users. With broadband users more likely than dial-up users to be online on a given day, the increased daily usage translates into about 3 and one-half hours more per week online for broadband users. In sum, members of the broadband population turn constantly to the Internet to satisfy all kinds of information needs. Broadband users are also more likely than dial-up users to have multiple online sessions on a given day. The high-speed home connection makes it twice as likely that a user will go online several times a day in comparison with a dial-up user. 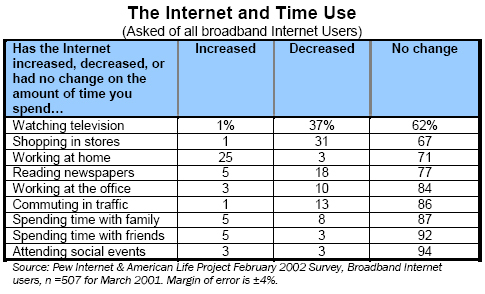 Four in ten (43%) of broadband users log on several times per day, while 19% of dial-up users do. The stark demographic differences between dial-up and broadband users, in conjunction with their vastly different online behavioral patterns, invite the questions: What really explains the heightened online activity levels of broadband users? Is it demographics, such as higher levels of income and education, which makes them more “information hungry” or more likely to communicate with others? Or is it the home broadband connection itself? We used regression analysis to determine what factors most accurately explain the intensity of a person’s Internet use. As it turns out, three variables are most powerful in predicting the likelihood that someone will go online on any given day, the length of time he will be online during that day, and the number of Internet activities he will do on a given day. The factors are: the presence of a broadband connection, the user’s length of Internet experience, and the user’s gender. In other words, broadband users are more likely than dial-up users to be online on any given day, to spend several hours online during their daily sessions, and to do more online activities on that typical day. Similarly, those with a lot of Internet experience are more likely than relative newcomers to the Internet to exhibit high levels of intense Internet use. And, finally, women are more likely than men to be intense users of the Internet. In sum, the impact of the home broadband connection is clear; broadband is the largest driver of the frequency of people logging on daily, the amount of time they spend online daily, and the number of Internet activities they do daily. Other factors come into play, but high-speed connections are the single biggest determinant of his Internet use. Our survey offers additional evidence that broadband is changing what people do online and how often they do it. Most broadband users – 61% – say they spend more time online at home since getting a high-speed connection, and one third say they do more work-related tasks since they obtained a broadband connection in the house. And they report that their information searches for random bits of everyday information have gone up because of broadband. Two-thirds (68%) of broadband users say that since they got a high-speed connection that have looked more frequently for such things as addresses, recipes, local events information and other facts they need. Broadband connections are changing people’s lifestyles. The Internet is the “go to” tool for a variety of functions—paying a bill, updating photos on the family Web page, listening to music, sharing files with co-workers, or getting news. For these users, the Internet replaces multiple tools, such as the telephone, TV, stereo, newspaper, fax machine, or pen, to carry out tasks. Needs are met on a real-time basis, with the Internet letting people’s creativity structure how they interact with co-workers, family, friends, and the wider outside world. A glimpse into a super-elite set of broadband users shows the transformative impact of a high-speed home connection in people’s lives. The analysis in this section focuses on the quarter of daily broadband surfers whom we call the broadband elite. These are those with high-speed home connections who, on average, do 10 or more online activities on a typical day. By contrast, on a typical day, the others in the broadband population do about 5 activities online. For the broadband elite, the Internet itself, with all its warrens of information and outlets for creativity, is the killer application. On a given day, they are more likely to do job research online or look for product information than check email. Further, broadband users are nearly as likely to share files with others on the Internet as to check email. For the broadband elite, the very high level of instant messaging (48% of the elite use IM on a typical day) suggests that IM-ing substitutes for email to some extent. The fact that the Internet itself is the killer application for these high-level users suggests the future of broadband’s success may hinge not on what many entrepreneurs have tried to develop: a hugely popular and singular killer app. Rather, it suggests that broadband will likely grow as more and more people gain experience, confidence, and trust online and come to recognize the wealth of material that broadband access can offer a seasoned user. Another distinguishing feature of the broadband elite is that they are information producers and downloaders. On any given day, fully 81% of the broadband elite creates information for the Internet, whether that is posting content to the Web, sharing files, or storing information online. Only 22% of the non-elite do this. Similarly, 78% of the broadband elite downloads files of some sort on a typical day, compared to 21% of remaining broadband users. Broadband elite members also are more likely to work at home—and work at home more often—than other high-speed surfers. Four in nine (44%) of the broadband elite say they telecommute, compared with 30% of other broadband users. Half of the elite (51%) say they telecommute several times a week, compared to 35% of remaining broadbanders. Demographically, members of the broadband elite tend to be technophile males at both ends of the age distribution. Fully two-thirds are men, whereas men make up just half of the other part of the broadband cohort. Roughly one-third (30%) are over age 45 compared with 15% of other broadband users and 18% are between the ages of 18 and 24, compared to the 9% of remaining users who fall into that age range. The younger broadband elite score highly in producing and downloading information relative to their older counterparts, while the more senior elite rate relatively highly in going online for job research and seeking news. And broadband elites live in households teeming with technology. Broadband elites are more likely than other users to access the Internet using a wireless device. One-quarter (25%) go online using a Blackberry, cell phone, or other wireless device; only 8% of other broadband users do this. About half of broadband elites (49%) live in homes with three or more computers, compared to 39% of other broadband households. High-speed connections also produce changes in some household functions. Users report that their broadband connections prompt them to change how they allocate their time. Such connections help bring the workplace into the home. Their presence results in the creation of home computer networks. And they place volumes of information easily at users’ fingertips. The broadband household is not just home to its occupants, but, as Penn State’s Jorge Schement has observed about households in the information age, an active node on an information network. Among other things, broadband users value a high-speed connection for its ability to let them grab a fact they need out of cyberspace—either from the Web or from someone they know. Fully 68% of all broadband users (and 75% of the broadband elite) say that they do more information searches for everyday things online because of the convenience of a high-speed home connection. When all broadband users were asked what they have spent the most time doing online since getting broadband to the home, they report that their searches for information and use of email far outpace other activities. We also asked broadband users whether they have spent more time online at home since getting broadband and, if so, what online activities took up this extra time. Fully 61% of broadband users said that they have spent more time online at home since their high-speed connection was switched on. The plurality of this increment of time online is attributable to information searching. One third (31%) say this extra time is due to more information searching online. About one-fifth (19%) say additional emailing is responsible for this extra time online, with 14% pointing to downloading music or movies as the reason and 13% saying online shopping has taken up the time. 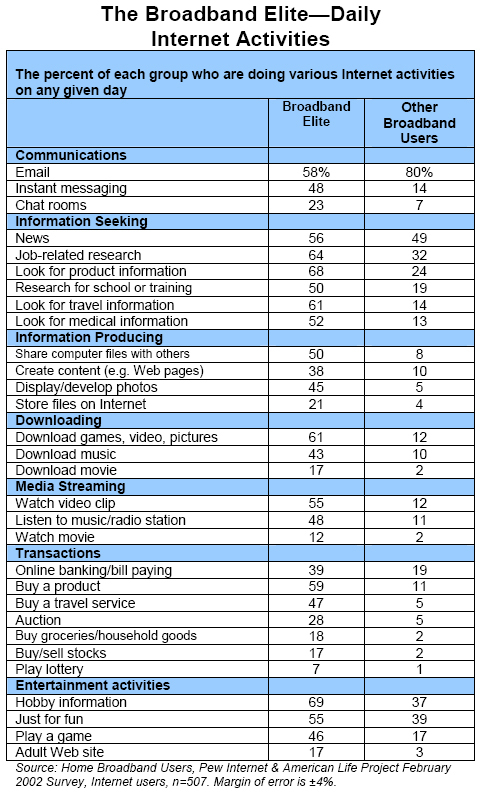 In sum, emailing and information searching are most popular among broadbanders. This is not too surprising, since most Americans view the Internet as an information resource like a library. When asked what the Internet is like, 51% of all Americans in the Pew Internet Project’s March 2002 survey likened it to a library and no other alternative metaphor such as “meeting place” or “shopping mall” comes close to that symbol of what the Internet is. Broadband users responding to online queries posted on the Pew Internet Project Web site were particularly vocal about how the always-on nature of the broadband connection lets them find out information they need. One put it succinctly, saying, “The always-on aspect [of broadband] has been a bigger feature than the bandwidth.” Others make a complementary point that a broadband connection allows them to turn quickly to the Internet to see what is playing at the movies and when, check weather reports, or get a recipe. Where the Internet, says one broadband user, was once a toy, “it is now a tool.” One user wrote that her sister calls her on the phone to ask her to do quick searches for information, as the sister is frustrated by the slowness of dial-up and knows her sister’s connection is always on. Broadband users report that the Internet has helped them manage a variety of tasks in their lives – sometimes simultaneously. With their ardent information-seeking habits, it is no wonder that 86% of broadband users say that the Internet has improved their ability to learn new things “a lot” or “somewhat”. This compares with 73% of Internet users who said this in March 2001. Nearly half (47%) of broadband users say that the Internet has helped improve the way they get information about health care; 54% of women say this versus 41% of men. 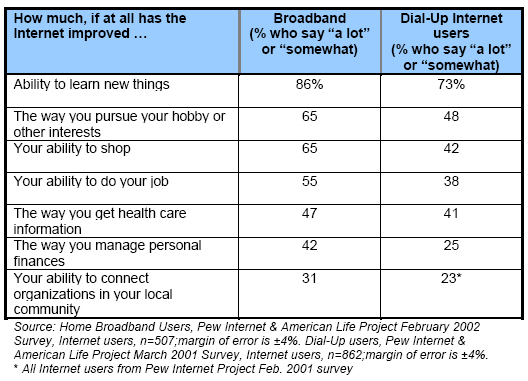 In the dial-up users’ universe, 38% told us in March 2001 that their use of the Internet improves the way they get health-care information. Forty-two percent if broadband users say the Internet has improved how they manage their personal finances, nearly twice the rate of dial-up users, 23% of whom said this in March 2001. 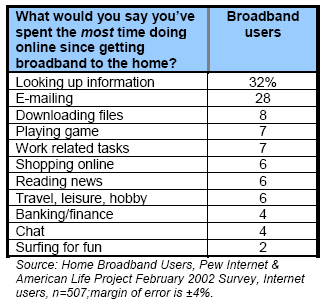 And 65% of broadband users say that the Internet has improved how they pursue their hobbies or interests, compared with 48% of dial-up users in our March 2001 survey. The same share (65%) say the Internet has improved their ability to shop versus 41% of all Internet users in March 2001. One-third of home broadband users telecommute at one time or another – and one in eight home do so several times a week. About 60% say high-speed access in the home means they telecommute more often as a result of having their fast home connection. Telecommuters are among the Internet’s elite users, whether that is measured by length of time they have enjoyed Internet access, the frequency with which they log on, and the time they spend online during their typical sessions. Fully 90% of broadband telecommuters go online on a typical day, and their average sessions on that day last nearly two and one-half hours (145 minutes). Three in five (58%) have been Internet users for 6 or more years, compared with 42% of all broadband users. Not surprisingly, telecommuters focus on Internet activities that are connected to their jobs. Two-thirds (66%) of telecommuters say they do more work-related tasks at home since they have gotten broadband; only 18% of other broadband users say this. On a given day, 64% of telecommuters with broadband at home use the Internet for job-related research, compared to 23% of other broadband users. The same number (64%) say that the Internet has improved their ability to do their job “a lot” versus 20% of other broadbanders. Finally, and essentially by definition, telecommuters say that their Internet use allows them to spend less time in traffic and working at the office and more time working at home. One third (31%) of broadband telecommuters say that the Internet has decreased the time they spend in traffic; only 4% of non-telecommuters with broadband in the home say this. Similarly, 29% of telecommuters say their use of the Internet decreases the time they spend in the office; basically none (1%) of non-telecommuters with broadband say this. Telecommuters are far from an “all work no play” breed. There is evidence that they have folded the Internet into other parts of their lives, perhaps because of their technological sophistication and perhaps also tied to their relatively high incomes. Since telecommuters spend more time at home, they have found ways to use the Internet to connect to their community. About 9% of non-telecommuters with broadband say the Internet has helped them get involved with groups in their community; by contrast 16% of telecommuters with broadband say this. And 16% of broadband telecommuters say the Internet has helped them get more involved with groups to which they already belong. Finally, there is some evidence—perhaps due to higher educational levels—that telecommuters with broadband are more civically involved. Fully 57% say the Internet has improved their knowledge of politics and public affairs, compared to 45% of other broadbanders who report this. With broadband users enjoying an always-on connection and using it to spend more time online, there is potential for changes around the house. We probed three possible areas of impact, namely whether it becomes more difficult to share the computer with broadband, whether the computer’s location changes, and whether family emailing changes. With respect to changing the location of the computer, there is not a lot of furniture moving around the house due to the acquisition of a high-speed Internet connection. One in nine (11%) of broadband users say they moved their computer after getting broadband. A clear virtue of the home broadband connection is that it makes it easier for family members to share access to the computer and the Internet. Four in ten (43%) of broadbanders say that the high-speed connection makes shared computer use easier and half (52%) say it helps make sharing Internet access. Only 4% say broadband has made sharing the computer harder and just 2% say this about Internet access. Broadband to the home seems to have eased traffic jams at the computer most for the broadband elite, which is not surprising since these users are more likely to have multiple computers in the home. Three in five (61%) of the broadband elite say it has become easier to share Internet access since getting broadband, and half (51%) say it has become easier to share the computer. With ease of sharing improving, people are spending more time online at home. When asked whether family members are spending more time online at home since getting high-speed access, 65% of broadband users say “yes.” For broadband elite three-quarters (75%) say family members have spent more time online since getting broadband. The broadband connection to the home is associated with users’ deeper connections to friends and family. It also has some effect on how people connect to their local community, meet new people, and address problems in their lives. 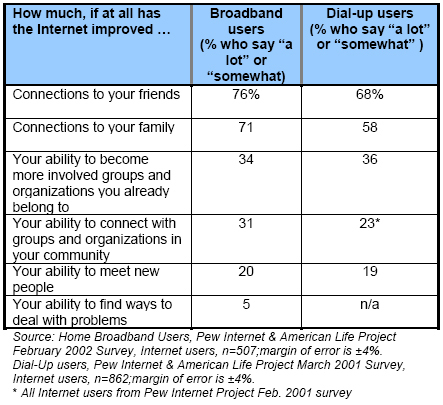 As the table shows, broadband users are more likely to attribute to the Internet stronger personal and community connections than dial-up users. This is probably due mainly to broadband users’ greater online experience. Prior Pew Internet Project reports have found that length of time online goes hand-in-hand with how people perceive the Internet’s impact on personal connections. Still, it seems as if the always-on connection leads to a rise in convenience emailing to family and friends that makes broadband users feel more connected to them. Broadband connectors also use the Internet to reach out to new people, their community, and for problem solving, although the impacts are not large. The broadband elite seems particularly adept at exploiting the Internet for these purposes. About one-fifth (18%) say the Internet has improved their ability to meet new people, and 13%—more than twice the rate for all broadbanders—use the Internet to help solve problems in their lives. Fully a third (31%) say the Internet has helped them become more involved with groups and organizations to which they already belong. Broadband to the home presents new technological challenges to users that go along with the benefits of the fast, always-on connections. With 69% of broadband users having more than one computer in the home, they have the opportunity to install computer network to link computers throughout the house. In fact, 55% of broadband users with multiple computers in the home have home networks; for those households with 5 or more computers, 90% have networks. Computer security presents another challenge to broadband users. With the Internet link constantly open, the potential exists for computer viruses or intrusive individuals to invade home computers, corrupting data and hard drives. Many broadband users have taken precautions in view of these threats. More than half of broadbanders (56%) have installed a computer firewall to guard against unwanted electronic intrusions, with the broadband elite most likely to have done this, as 69% of those users have installed firewalls. Indeed, there is some reason for concern for broadband users; 14% have contracted a computer virus that they attribute to the always-on nature of their broadband connection. For that reason, 70% of users who have gotten viruses have installed firewalls. There are, however, a few frustrations for broadband users. When asked whether their broadband connection has worked everyday without interruption, half say it has and half say that it has not. In terms of reliability, broadband is not yet on par with, say, the telephone or electric utility service. And some users express dissatisfaction about the speed of their high-speed connection. About one-quarter (23%) report that they are “frequently” or “sometimes” frustrated by the speed of their broadband connection, a finding that is consistent for DSL and cable modem subscribers alike. Fully two-thirds say they are frequently bothered by “pop-up” advertisements and three quarters (73%) say they receive unwanted junk email either frequently or some of the time. Several respondents to our “query of the moment” said unwanted junk emails increased once they got broadband at home. This March we asked in our regular phone survey of dial-up users whether they would like to have a home broadband connection or not. Four in 10 (40%) said they would like to have a high-speed connection at home, with 58% saying they would not be interested in upgrading to broadband. Of course, things change. Internet technologies, the speed of broadband connections, and people’s preferences will all likely change with time. The longer a dial-up user has been online, the more likely he is to want broadband in the home; 53% of dial-up users who have been online for 6 or more years say they want broadband at home. Assuming time online increases for all users the likelihood that a user wants broadband, and assuming the user eventually purchases home high-speed connections, this means 64% of Internet users would eventually be home broadband users. This does not necessarily mean that 64% is the ceiling for broadband penetration among U.S. Internet users. A host of factors (e.g., changing prices, nature of Internet content, quality of connections, a “network effect” by which the growing number of broadband users prompts others to obtain such connections) could change this ceiling. We asked broadband users to rate their experiences using their high-speed connections for a variety of activities that are especially attractive with high-speed connections. 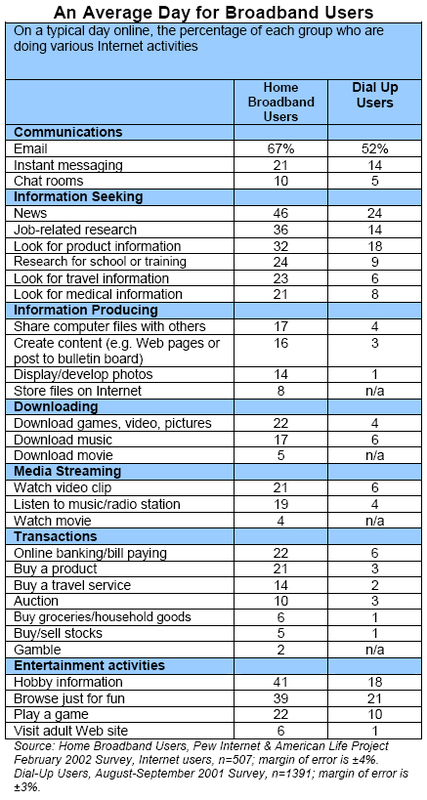 The tables in this section summarize the share of broadband users who have ever downloaded files, streamed video or audio content, and played games online. They also explore the frequency with which broadband users do these activities now that they have broadband to the home. Downloading and streaming are the most popular “new media” activities for broadband users, with the high-speed connection encouraging a strong majority of these users to do these activities more often. The broadband elite, as might be expected, lead the way on downloading; 92% have downloaded files to their computer, 40% do so frequently (versus 30% of the non-elite) and 76% have engaged in downloading more often since getting broadband in the home (versus 64% of the non-elite). For streaming, 72% of broadband elites have done this, with 81% doing it more often since they got their home broadband connection. Fully a third (31%) of the broadband elite stream audio or video several times a week or more, compared to 17% of other broadband users. For game playing and watching movies online, not as many broadband users have done these things, although for online movies the broadband connection is very likely to increase the frequency of doing that. Again, the broadband elites lead the way in these areas, with two-thirds (66%) having played a game online. However, broadband elites are no more likely than other broadbanders to say that the high-speed connection has increased their online game playing, as 46% of all broadband users say this. Broadband elites are also no more likely than the rest to say they are “very satisfied” with online game playing over a broadband connection. One thing a broadband connection does for game players is to let them experiment with different types of games. Fully 45% have tried a new online game since obtaining broadband in the home, with 51% of the broadband elite having done this. A theme throughout this report is that a home broadband connection results in a surge in the number of activities that these Internet users do on a typical day and the amount of time they spend online. As noted, 61% of broadband users say they have spent more time online at home since getting the broadband connection; only 5% say they have spent less time online and the remainder (33%) report no change. Where do broadband users find the extra time to engage in their high-speed surfing? About 3 in 8 (37%) broadband users cut back on watching television, with about a third saying they spend less time shopping in stores as a result of the Internet. This decrease in TV watching is most pronounced among those most active in using the Internet for entertainment purposes. For many broadband users (25%), longer daily online sessions translate into doing more work at home. Indeed, for the one-third of our broadband sample that identifies themselves as telecommuters, it is not surprising that 58% say the Internet means they spend more time working at home. Nearly one-third (29%) say that it cuts down on time spent at the office, which in turn lessens the amount of time spent commuting in traffic (31% say the Internet reduces time in traffic). Finally, about a fifth (18%) of broadband users say their use of the Internet means they spend less time reading newspapers. For most of these people, the Internet substitutes for the newspaper. For certain types of broadband users, distinct impacts on time use emerge. Those who download music and movies from the Internet or play games on line are most likely to cut back on watching television; 44% of these users say the Internet has decreased TV time. For those who create content for the Internet (e.g., helping to create a Web page), 34% of these users say the Internet has led to an increase in working at home. The increased time at home and facility with the Internet also keeps content creators out of stores; 39% of them say the Internet has decreased the time they spend shopping in stores. Telecommuters, as noted above, have substantial and expected changes in time use due to the Internet. Three in five (58%) of telecommuters spend more time working at home because of the Internet, 31% spend less time in traffic, and 39% spend less time shopping in stores. Finally, the Internet’s impact on spending time with family, friends or attending social events is modest for broadband users. A few more broadbanders say the Internet decreases time spent with family rather than increasing it (by an 8% to 5%) margin, with a smaller and slightly countervailing trend for friends. A striking pattern emerges, however, when looking at telecommuters and differences between men and women. About 11% of telecommuters with broadband say the Internet has led to a decrease in spending time with family with 9% saying it has increased time spent with family. For men, 10% say it has led to a decrease while 5% say it has led to an increase in family time. The trend is reversed for women; 13% of female telecommuters with home broadband say the Internet has increased family time with 11% saying it has led to a decrease. Broadband Internet users clearly drive in both directions on the information superhighway, generating content and uploading information to the Web in addition to being active downloaders and information seekers. Whether this pattern will hold true as home broadband connections diffuse more widely is difficult to predict. In a longitudinal study last year, we found that Internet usage patterns of late adopters largely mirror those of early adopters. That is, with the passage of time, users who are new to the Internet begin to do things online, such as transactions, which their veteran counterparts have been doing for some time. Will broadband users of the future be as active as today’s in generating content and uploading data to the Web? It may be that early broadband adopters have unique characteristics, perhaps having to do with their jobs, education, and income, which explain their usage patterns. Not all occupations, for example, lend themselves to telecommuting and we have seen that telecommuters are ardent broadband users. This could well be the case, although, if the “new economy” is indeed new and enduring, one would expect in the future that a wider range of jobs will be intensive in the management and generation of information. Such jobs would likely benefit from high-speed two-way connections in the home. With life-long learning and continuous training of growing importance to all segments of the workforce, and with this report showing a sharp increase in these activities for broadband users, one would expect many kinds of Internet users to benefit from fast home connections. Finally, one would expect that families of any kind would value sharing photos, video, or other memorabilia online via fast Internet connections. A clear policy implication of the bi-directional data flow generated by broadband users has to do with the “open access” debate. This issue came to light in the mid-1990s when the cable authority in Portland, Oregon, tried to assert its right to compel a provider of broadband to the home—in this case a cable system acquired by AT&T—to allow any Internet service provider (ISP) to offer services over its network. Just as telephone companies, as common carriers, are required to allow any ISP to offer service, cable providers of Internet services, it was argued, should also have to provide the same “open access” to other ISPs. Fears about monopoly control were part of the debate. Specifically, some were worried the provider of the broadband connection to the home could leverage that connection to gain control over the types of information and services that were provided through that operator’s wires. Others were fretful that a lack of open access might attenuate the free flow of online content – i.e. that a broadband provider might not permit users to access to all content on the Worldwide Web, which has been the ethic of the Web since its inception. As Stanford law professor Larry Lessig has documented in The Future of Ideas, there are reasons to believe that the authority to control the flow of content may result in actual restrictions on content availability. Some companies are developing technologies to allow providers to develop “walled gardens” online that give preference to content specified by a service provider. And some cable networks, which presently are legally able to restrict content flows, have imposed restrictions on subscribers. Some cable broadband providers prohibit customers from operating a Web site. In addition, some providers engage in “filtering” by which packets of information are examined by the provider and certain packets (e.g., those associated with file sharing) are discarded. Other restrictions include prohibiting home networks (something 55% of broadband users with multiple computers have) and limiting the number of minutes that users can stream video over their high-speed connection. The tendency of broadband users to create content for the Internet, upload, and store files indicates that high-speed users value the ability to post material online that is available to a wide range of other Internet users. This suggests that “open access” is a policy that broadband users would endorse. Recently, after lengthy litigation left the “open access” issue in its lap, the FCC classified cable broadband as an “information service.” This means that federal “open access” rules that apply to phone companies do not apply to cable providers. The policy debate continues, however, as ISPs argue that a condition for approval of the proposed merger between AT&T and Comcast should be a congressionally mandate about “open access” that would apply to all providers of broadband. ISPs point out that a formal “open access” condition was placed on the AOL/Time Warner merger by the Federal Trade Commission. Whatever policy instrument—if any—is chosen to address “open access,” it seems clear from this research that the ability to upload material and make it available to a wide audience is something that is attractive to a significant segment of the broadband using community. Early adopters of broadband to the home are unmistakably producers and users of all varieties of online information and applications. This is likely to shape the future development of the Internet, as consumers demand upload speeds equal to download speeds and continue to value the Internet’s extensive connectivity of information and people. The lack of any “killer app” among early users of broadband shows that they are anxious to use all facets of the Internet, using their always-on connections to transition seamlessly between checking on a work project, seeing what time the movie is playing, updating the family Web page, all the while listening to a favorite radio station a thousand miles away. Whatever the precise usage patterns of future broadbanders, it seems likely that they too will value the same things current high-speed users do—greater and easier access to information, new capacities to generate it, and more control over how the online world can help in their day-to-day lives.